March 7, 2013 Co-Teaching Professional Development- Day 2 Presenter: Betsy McDorman and Jen Bower PLC Summarizer: SMS teachers thoughts on: The most. 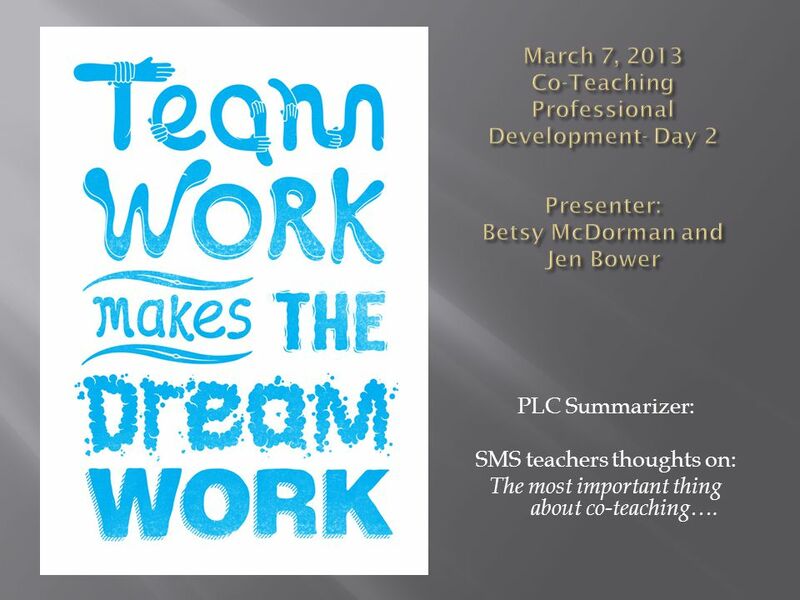 PLC Summarizer: SMS teachers thoughts on: The most important thing about co-teaching…. 2 The most important thing about co-teaching…. 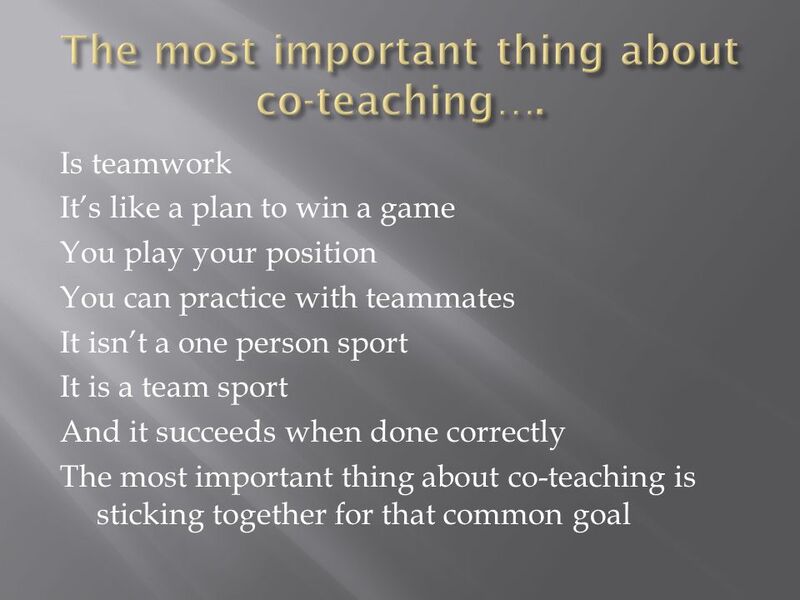 3 The most important thing about co-teaching…. 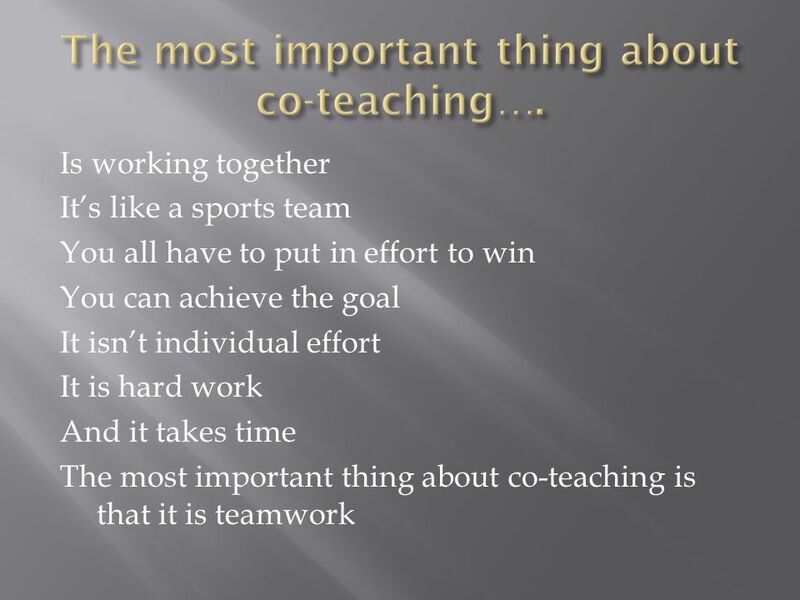 4 The most important thing about co-teaching…. 5 The most important thing about co-teaching…. 6 The most important thing about co-teaching…. 7 The most important thing about co-teaching…. 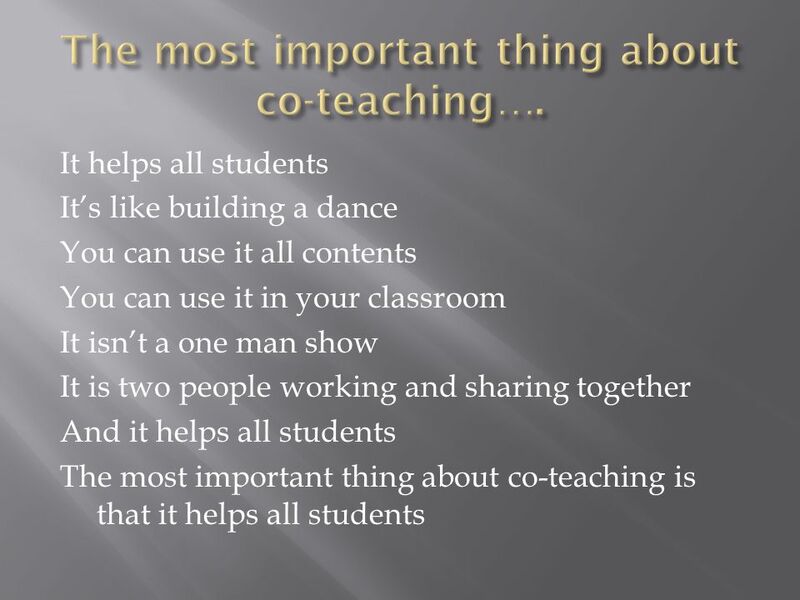 8 The most important thing about co-teaching…. 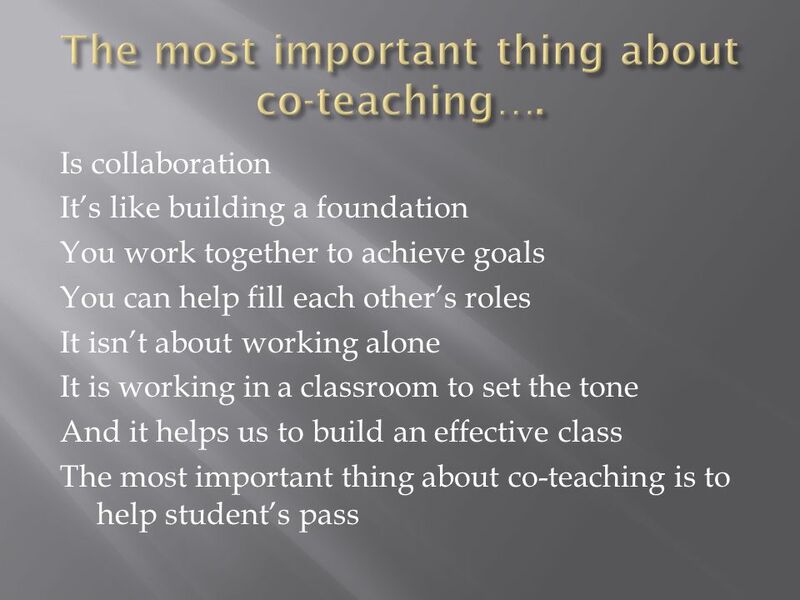 9 The most important thing about co-teaching…. 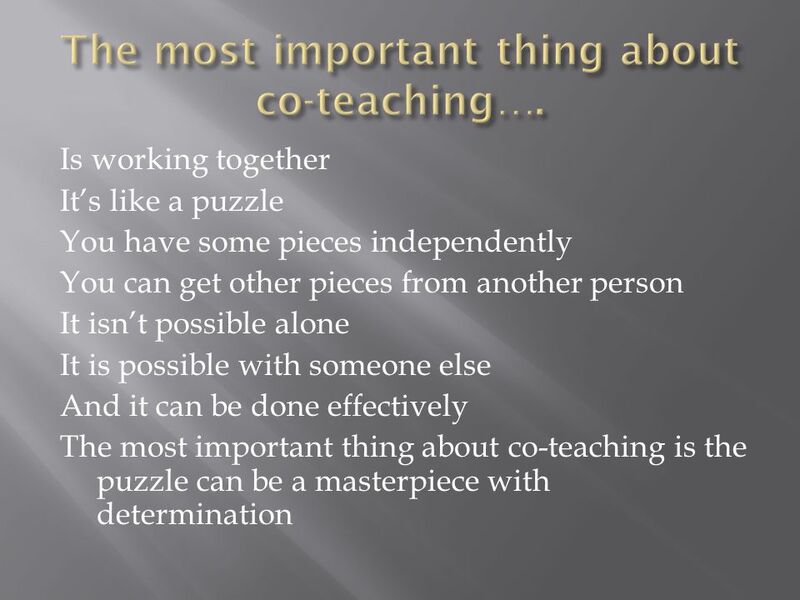 10 The most important thing about co-teaching…. 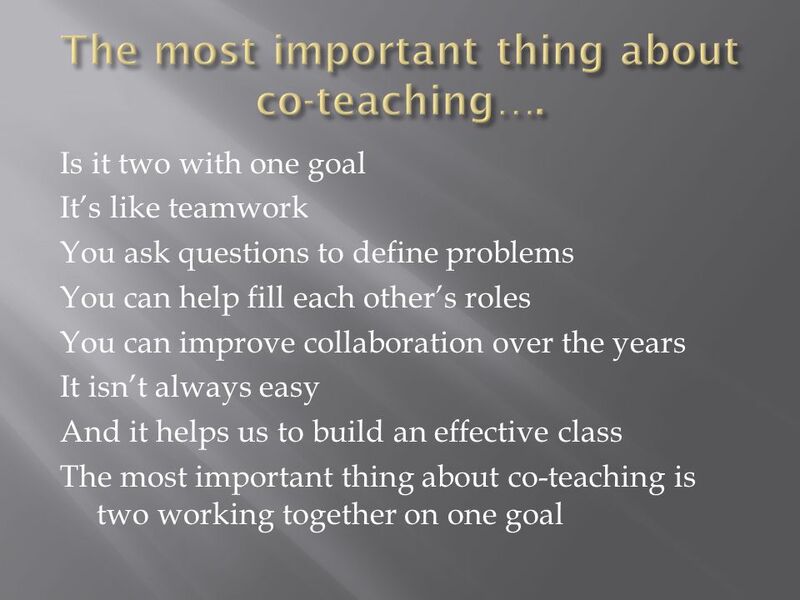 11 The most important thing about co-teaching…. 12 The most important thing about co-teaching…. Download ppt "March 7, 2013 Co-Teaching Professional Development- Day 2 Presenter: Betsy McDorman and Jen Bower PLC Summarizer: SMS teachers thoughts on: The most." Teacher Note: The following slides can be used in class to introduce aspects of appropriate behavior in sport Teacher Note: The following slides can be. Newburyport University In the student’s seat Newburyport University 11/6/12 A Whole New Perspective. Tips for Working in Teams or Groups. Not always easy  What challenges have you had when working in a team or group? Instructional Leadership through Coaching Steve Barkley. What do you want to be? What are you good at? What do you like? Sweet Trading!. The 5 Rules of Negotiation No. 1Make a Plan Remember, you are planning to fail if you fail to plan! The plan involves the next 4 stages. All You Need Is Love Love, love, love, love, love, love, love, love, love. There’s nothing you can do that can’t be done. Nothing you can sing that can’t. Synergize.  Synergy: when two or more people work together to create a better solution than either could alone.  It’s not your way or my way, but a. Meeting the needs of all learners.  Is differentiated instruction new? ◦ Think of the one room school house. ◦ Can you remember how your elementary teachers.  Competitive dance is a widespread activity that requires dancers to perform dances in any of the several permitted dance styles.  Acrobats  Ballet. By: Frank Rubino More about the author: Audience: People against physical education. Mackenzie MacLeod. Sportsmanship Respect Leadership Responsibility Teamwork.  The Player  Objectives  Procedures  Rules  Resources  Conflict  Boundaries  Outcome.  Controlling Attention  Controlling extraneous stimuli in the environment  Controlling desired behaviors  Using more than one sensory modality.